I hope this post finds you "busy" relaxing, savoring a nice long holiday break with your loved ones. It feels like we've been feasting for days and weeks on end but we have to save room for one more very-important celebration: New Years! Even while I was deeply (and happily) entrenched in the whirlwind of Christmas cookie-making during the past few weeks, I'd been thinking about appetizers, party food, small-bites that would be perfect for that New Year's toast! Well, the champagne is chilling in the fridge so let's talk about a couple of great bites to go along with it. First, I have to spread the crostini love with this recipe for croque monsieur crostini from Marie at little kitchie. I love visiting Marie's site for dinner inspiration and she has indeed inspired me in many ways; I have her to thank for encouraging me to make homemade pizza and when we tried weeknight bolognese, it quickly became a family favorite. 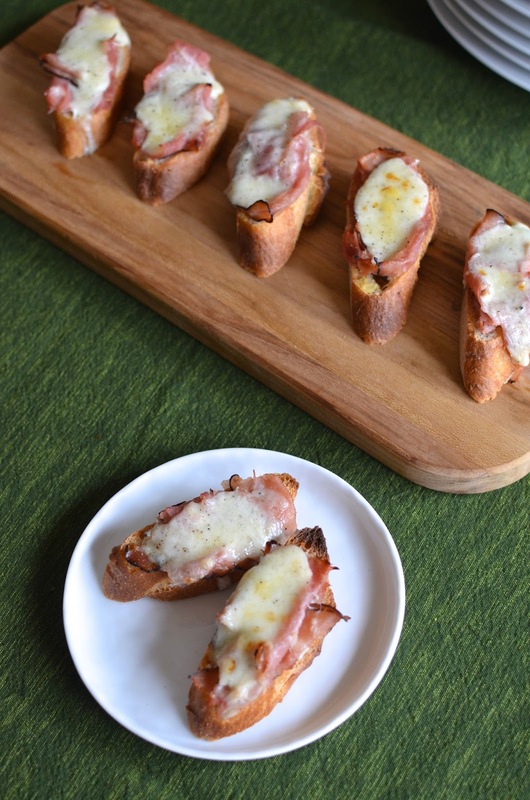 Recently, I saw this genius idea for croque monsieur crostini that I knew would be delicious and make a great party appetizer. It's everything you love about a croque monsieur - that delectable French ham and cheese sandwich - in miniature form. When we vacationed in Paris with the little guy a couple of years back, we would order a croque monsieur for him at lunch almost by default. I had romantic notions of making them at home and eating them while sipping some sparkling Lorina lemonade alongside. But you know what? I never did make the sandwiches at home. It always seemed just a bit too decadent, a little too finicky, when I thought about it. But turning it into crostini, reducing the portion size significantly into small bites, takes that decadence level to an ideal indulgence for New Year's eve or any other gathering. It's satisfying without being overly heavy. I especially love the sharp crunch of the toasted baguette that you don't get with the traditional croque monsieur. It's a must-try! My other recent discovery is bacon wrapped chicken bites. For those of us who eat meat, you know that anything wrapped in bacon or prosciutto is practically guaranteed to be good and this is a fine example. This recipe comes from Mel's Kitchen Cafe, a site I started visiting recently (I can vouch for the pulled pork recipe if anyone is looking for one), and her testimonial for these chicken bites convinced me to make them right away. 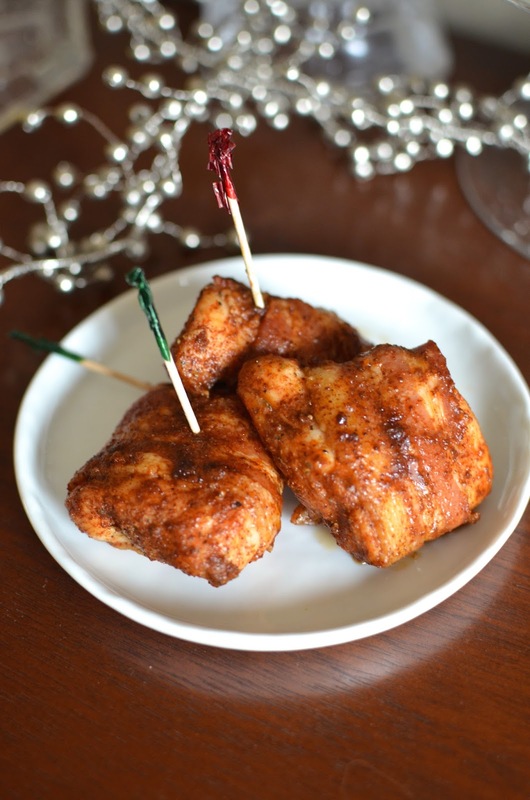 These chicken bites are not only moist, they're also flavorful and zesty from herbs (dried oregano, thyme) and spices (chili powder) as well as some sweetness from brown sugar. It's got the entire spectrum of salty, sweet, spicy, heat, and savory all rolled in one. I made these recently for dinner as a test drive. For a cocktail party, I'd make the chicken pieces a bit smaller than I did here to leave room for all the other goodies you'll undoubtedly be nibbling on throughout the night. Many thanks to the ladies from the sites I mentioned above for these great little bites! * Have a safe and fun New Year's eve celebration! May the New Year bring all the good things - including good health and good food - your heart desires! While the bread is toasting, make the bechamel. Melt butter in a small saucepan over low heat. Add flour and whisk for 2 minutes. Slowly pour in the hot milk, whisking constantly, and continue cooking and whisking until thickened. Remove the pan from the heat. Add salt, pepper, nutmeg, and 1/2 cup of gruyere. Top each slice of toasted baguette with some mustard, a bit of ham, and then top with some of the cheese sauce. Sprinkle the top with some more gruyere. Bake for 5 minutes. Turn on the boiler and broil for 3-5 minutes, until the topping is bubbly and lightly browned. Remove from the oven, top with a grind of black pepper, and serve immediately. Preheat oven to 350 degrees. Place an oven-safe cooling rack on top of a large foil-lined baking sheets and spray it lightly with cooking spray. If you don't have a cooling rack, line a baking sheet or broiler pan with foil and lightly grease with cooking spray. Cut the chicken breasts into bite-size pieces and place into a medium bowl. Toss with the salt, pepper, oregano, thyme, garlic powder, and crushed red pepper flakes. (You could refrigerate the chicken at this point for up to a day). Mix the brown sugar and chili powder together in a small bowl. Slice the bacon into thirds (for the larger bites pictured here, I sliced my center cut bacon slices in half). Wrap each piece of chicken with a strip of bacon. Holding tightly, dredge the bacon wrapped chicken in the brown sugar-chili powder mixture. Place onto the prepared baking sheet. If necessary, you could secure the bacon to the chicken with a toothpick. Bake for 20-25 minutes, or until bacon is crisp and chicken is cooked through. If not baking on a rack, flip the chicken midway through the cooking time. If using thick-cut bacon, baking time will be longer. Serve immediately. Both are very tasty and not even difficult to make...I love those bacon wrapped chicken bites a lot! Yes, the ease of making is a big thing with me. : ) Hope you had a great Christmas. Happy New Year! I love this appetizer round up! So perfect for NYE. Hope you guys had a lovely holiday! I would adore all of these for my celebration! Happy New Year my dear. All the best for lots of wonderful milestones and more achievements in 2015! That is so nice of you to say. : ) Happy New Year - hope it brings you lots of good luck and great food! Hope you had a very merry christmas Monica! 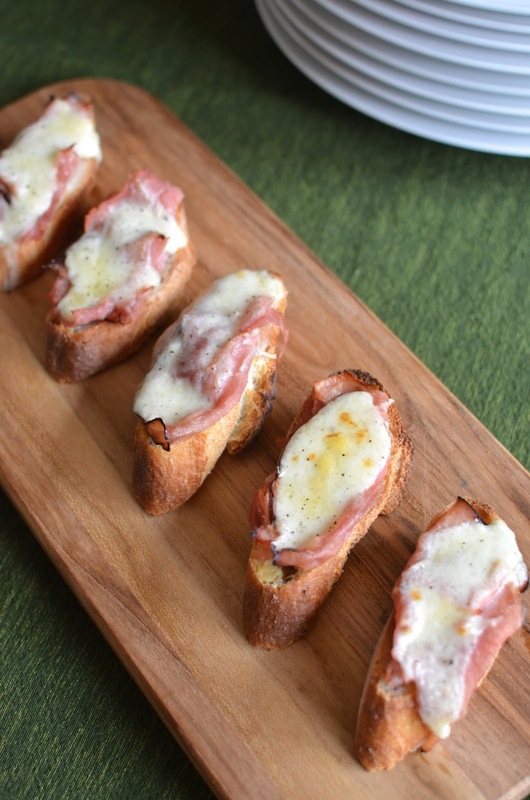 Those croque monsieur crostini are such a great idea! I'm brainstorming what to make on NYE right now ... too many recipes I want to try! Hi Ashley - Christmas day felt like the culmination of so much preparation! haha...it was great - thoroughly relaxing and I just got to indulge in everything I had my mind set on! We're still chilling here and looking forward to NYE. Hope you are having a nice break and Happy New Year!! What lovely crostini and chicken bites! Both look very tasty and easy to make. Thank you, Balvinder! They really are easy to make and satisfying (would go well with one of your husband's cocktails)! Have a great New Year ahead! This is basically heaven. I had a croque madame yesterday and haven't stopped thinking about creative ways to recreate it in the kitchen... And then I stumbled upon this! Awesome! I will be so popular if I make these for my New Year's Eve party!! They look heavenly! haha - thanks, Ashley! Your sausage balls look pretty darn amazing! : ) Have a great celebration! Yes, we are Kelly. Thank you! Enjoy the rest of the holidays and have a great celebration to kick of the New Year! These are perfect for a NYE celebration Monica! The croque Monsieur crostini are perfect and genius. In fact I was in Paris the weekend before Christmas celebrating my daughter's birthday - a girly trip for us both - so these flavours are very fresh for me. Delicious. I hope you and your family has a fabulous Christmas and are enjoying a well deserved break. Wishing you a very Happy New Year!! Hi Tricia - hope Christmas was magical! I know you'll ring in 2015 with style. Here's to a great year ahead. I know you will show us many delicious eats and I cannot wait! Definitely a great use for leftover ham! Perfect festive bites! Very happy New Year to you and your family! May 2015 be another year of delicious creations for you! Same to you. Have a great 2015! Oh my goodness, just look at those chicken bites. I am so loving this post. Happy New Year! Thank you! Happy New Year!! Wow!! Drooling...these two dishes look delicious! Honestly, anything wrapped in bacon is a love-at-first-sight for me haha. Have a happy new year, Monica!! I know - anything wrapped in bacon is good! : ) Have a wonderful New Year! haha - true that! : ) Happy New Year! OMGosh, these both look fabulous Monica! I wanted to stop by today to wish you a Happy New Year! Here's looking forward to wonderful things for you and your family in 2015! Thank you - hope you have a great NYE celebration to kick start a wonderful 2015! Those look absolutely amazing! Congratulations on a fantastic year, and best wishes for a wonderful 2015 filled with lots of delicious food! That is so nice of you. Same to you and sending you good vibes for the best year ever! A big Happy New Year to you! I hope there is plenty of beautiful cakes and happy creations in your kitchen to keep you (and us) smiling in 2015! Noodles cannot be beat but these little bites were such fun. And I have to say a diet of appetizers and desserts sounds divine! These are both great little apps! I'm always looking for quick and easy things to make for company. Quick and easy is life's quest. ; ) The crostini does take some assembly/work but it pays off if you are making a bunch for company.